Sometimes people wonder why runners run. But I almost have the opposite thought — why doesn’t everybody run? It’s a great way to exercise while enjoying the great outdoors and exploring scenic locations. You get to meet awesome people that you might never cross paths with if you weren’t all runners. There’s a supportive community of fellow runners, both in person and online. You can set goals, work toward meeting them and see how your training pays off. I’m a 28-year-old who lives in Salisbury, Maryland. I’ve lived in Salisbury since the fall of 2008, when I began attending college at Salisbury University, aside from three summer breaks. In March 2016, I started a job as the assistant director of marketing and public relations for Wicomico County Recreation, Parks & Tourism. Prior to that, I was a local news reporter. I grew up in Hampstead, in Carroll County, Maryland. That was where I started running. In 2004, I wanted to make the high school soccer team as a freshman. The training worked and my run went well, but I didn’t make the team, and I also didn’t make the basketball team that year. I was a distance runner on the track team for four years, and I also ran cross country during my senior year, which I especially enjoyed. I even used my story of how I ended up running cross country for my college essay. My senior year, the soccer coach said I could be on the team but wouldn’t play in any games, so I decided to try a new sport. It’s crazy to think what might have happened if I had been better at soccer. Would I even still be a runner today? Now, I’m part of the Eastern Shore Running Club, Pemberton Running Club, 11:30 Club, Midshore Multisport and Delmarva Moms Run This Town here in Salisbury. I also enjoy being part of the online running community and participate in #bibchat on Tuesday nights. I am a BibRave Pro team captain, a Sweat Pink Ambassador and an ambassador for the St. Michaels Running Festival. 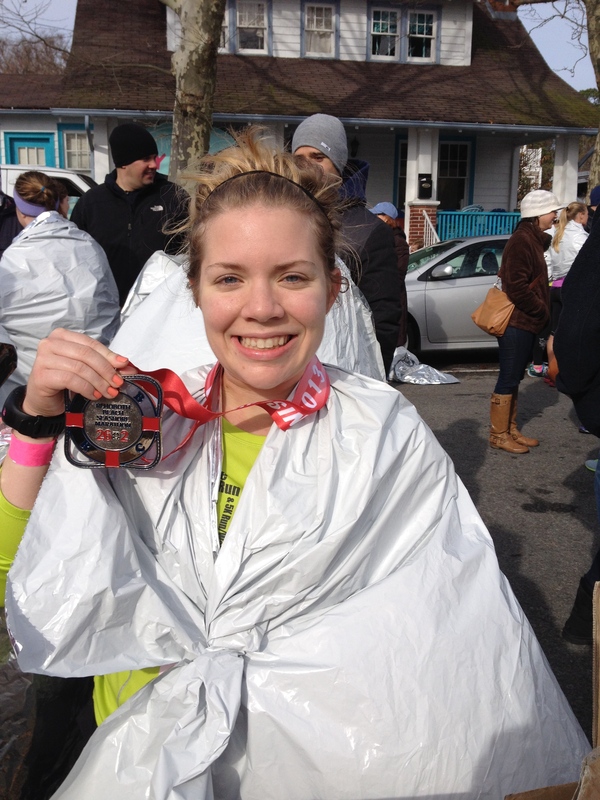 I enjoy pacing races and I am a pacer for Beast Pacing and the OCMD Island to Island Half Marathon. I have paced six half marathons, beginning in April 2016. I became a Road Runners Club of America Level 1 certified coach in July 2018, and I also write articles for RunWashington. I love setting PRs at races, but I also really enjoy laid-back runs and just enjoying the scenery. While writing and running take up much of my time, I do have some other interests. Spending time with my family, boyfriend and friends is important to me. I enjoy food, craft beer and making cookies. I love getting the chance to see different places by traveling or taking day trips. I hope you enjoy keeping up with my running as much as I enjoy writing about it. Follow me on Twitter at @VanessaJunkin for plenty of updates on my running and whatever else I’m up to. Also feel free to check out my race times on Athlinks here.